New York, NY, June 14, 2017 – The Phys Ed 4 All Coalition (PE4All), of which the Institute for Family Health’s Bronx Health REACH is a partner, applauds Mayor Bill de Blasio, Council Speaker Melissa Mark-Viverito and Schools Chancellor Carmen Fariña for the city’s announced Universal Physical Education (PE) Initiative which will provide all schools with a designated space for effective PE by 2021. The plan will address 200 schools that do not currently have access to a gymnasium or other appropriate recreation space for PE instruction. The first phase of the initiative will focus on 76 schools that don’t have any designated PE space and will cost approximately $385 million over the next four years in capital funding. National guidelines recommend moderate to intense physical activity for children at least one hour a day. To help meet these, the American Heart Association recommends elementary students receive 150 minutes per week and middle and high school students receive 225 minutes per week of instructional physical education. New York State law requires school districts to provide 120 minutes of physical education in elementary and middle schools and 90 minutes in high schools. There are several benefits to being active for children. Studies show that when kids participate in daily physical education, there is an immediate benefit to their ability to learn in other classes and achieve higher test scores. Not only does physical education increase academic achievement and improved classroom behavior but the skills learned in physical education lay the foundation for a lifetime of fitness that our city cannot afford to lose. “Physical education is critical for lifelong healthy development, as well as academic success, for children. Citizens’ Committee for Children is so pleased that Mayor de Blasio and Chancellor Farina have continued their commitment to addressing NYC’s longstanding issue of being out of compliance with state PE requirements- this time by making a very significant investment to ensure every New York City public school has appropriate space for physical education,” said Jennifer March, Executive Director, Citizens’ Committee for Children. “New York City’s Universal Physical Education (PE) initiative to provide all schools with a designated PE space by 2021 is an important acknowledgment that the facilities of many NYC schools do not currently meet the requirements of state law. 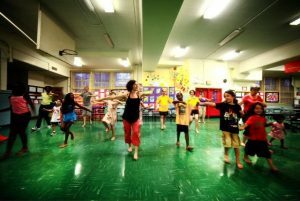 All New York public schools are required to provide all students with suitable and accessible facilities that include adequate specialized spaces for libraries, laboratories, auditoriums, gymnasiums, and playgrounds (see, CFE v. State of New York, 2003),” said the Campaign for Educational Equity. “Thank you Mayor de Blasio for making Physical Education a top priority. Physical Education is a crucial part of adolescent development mentally, physically and socially,” said Brian Semonian, Founder, Phys Ed Plus. “New York Lawyers for the Public Interest remains deeply committed to ensuring that this significant investment in physical education leads to an actual improvement in rates of participation among students. We are particularly concerned with the below average rates of participation in the youngest grades throughout New York City. We look forward to working with the DOE and our community partners to improve the quality and quantity of physical education across our City,” said Christine Appah, Senior Staff Attorney, Environmental Justice Program, New York Lawyers for the Public Interest (NYLPI). “Two years ago, City Comptroller Scott Stringer released ‘Dropping the Ball,’ an analysis that revealed that even 28 percent of New York City public schools lack a designated physical education space. As a physical education and swimming teacher, I am more than happy to learn that the aim of the Universal Physical Education (PE) initiative is to provide all schools with a designated PE space by 2021. I will personally advocate that renovating and building the swimming pools becomes one of the future priorities as well because there are too many students in NYC who don’t know how to swim. Drowning is the 3rd leading cause of unintentional injury death, accounting for 7% of all injury-related deaths (World Health Organization, 2016). The vast majority of drownings are preventable and that starts with education. It is imperative that we empower our students and community to prevent drowning through education,” said Srecko Mavrek, board member and past president of the NYC Zone, NYS AHPERD. The Phys Ed 4 All coalition is comprised of community-based organizations, advocates, parents, educators, and health professionals who are deeply committed to improving wellness by increasing access to physical education in New York City public schools. The PE4All coalition takes a multi-pronged approach to improving PE access, including community education, outreach and legislative advocacy.